I started applying for faculty jobs in 1983, after about a year and a half as a postdoc. The job market was tight then, as the US was coming out of a deep recession. (Sound familiar?) And faculty jobs in microbial evolution simply didn’t exist in those days. So I applied for any and all positions that had anything to do with ecology or evolution, whether at big universities, small colleges, or anywhere else. The first year I sent out around 75 applications, as I recall. And I do mean sent out, because in those days applicants had to copy things and mail them. I had one interview, but no offer. Meanwhile, Bruce Levin’s grant that was going to support me going forward got rejected. My wife and I had one child, and our second was on the way. I wasn’t panicked, although maybe I should have been! However, I did start vaguely thinking about back-up plans. I was good with numbers, and I’d written a couple of papers on the analysis of life-table data with Phil Service when we were grad students. So when I saw an announcement for some talk on actuarial analysis, it caught my eye. I thought that might be a possible alternative career. I went to the talk, and I might even have gotten a business card from the speaker. In the months ahead, Bruce revised and resubmitted the grant and, thankfully, it was funded, so I was secure for a while longer. The next year, I again sent out applications far and wide. I had a couple more papers, so my CV was stronger and the economy was improving, too. I got three interviews and, with my postdoc secure, I actually declined another one. However, the interviews were near the due-date for our second child, so I worried that I might have to cancel (and reschedule, if they’d allow it) the interviews. Luckily, #2 arrived in time. So I left my wife at home with a 10-day old baby and a toddler … and took off for back-to-back-to-back interviews. Soon after I got home, I got two job offers on the same day. (When it rains, it pours.) One offer was from UC-Irvine, and that’s where we went after deferring the start for a year so I could get more research done as a postdoc. I see there’s a lot of angst out there about the job market in academics. And rightfully so. Positions are scarce, and the competition is extraordinary. I feel fortunate that I got a very good faculty position to start my career. Things were tough back in the day, but they are much tougher now. I admire all of you who are pursuing your dreams, but it never hurts to consider a backup plan – whether you need to use it or not. There are, after all, many roads to happiness and success. This is the third in my series of must-read papers. It’s an elegant paper that sits right at the interface of ecology, evolution, and behavior. And like the last paper that I wrote about, this one is superb for teaching and capturing the interest of students. Chao, L., and Levin, B. R. 1981. Structured habitats and the evolution of anticompetitor toxins in bacteria. Proc. Natl. Acad. Sci. USA 78, 6324-6328. Short summary: Some bacterial strains produce and release toxins that kill members of their own species – except, that is, close kin that possess a linked immunity function. The production of the toxins is also lethal to the small fraction of cells that actually do so in any given generation. Lin Chao and Bruce Levin sought to understand when and how this trait would be beneficial. When killer and sensitive strains competed in liquid, the killer strain prevailed, but only if it started out above a threshold frequency. That raised the question of how the killer strain could reach that frequency, because it was at a disadvantage when it was below that threshold. When the same strains competed in a structured environment (a gel-like matrix), this conundrum was resolved—the killer strain could invade a population of sensitive cells even if the killers started at an arbitrarily low frequency. The difference arises because, in the structured environment, the resources made available by the killers accrue disproportionately to the killers’ kin. This paper was ahead of its time, but it set the conceptual stage for the now-blossoming field that uses microbes to study the evolution of social traits and interactions. Some additional background and explanation: Many bacteria can produce and release toxins that kill other members of the same species. These toxins are called bacteriocins in general; those studied by Chao and Levin are also called colicins because they are produced by, and used against, E. coli. The toxin production and immunity functions are tightly linked in a genetic module, and such modules are often located on extra-chromosomal elements called plasmids. Interestingly, the production of the toxin is lethal to the individual cell that does so, because the cell must lyse to release the toxin. However, only a small proportion (maybe 1%) of the potential killers that carry the toxin/immunity module actually produce toxin in a given generation, while the others constitutively express the immunity function. How can a function evolve that is lethal to the individual organism that expresses it? Chao and Levin began by competing two otherwise identical E. coli strains—one that carries the toxin/immunity module, the other sensitive to the toxin—in a well-mixed liquid medium. Let’s call the strains K and S for killer and sensitive, respectively. If there were enough K cells (above ~2% in their experimental conditions), then K rose in frequency and drove the S type extinct. Although the K population experienced some deaths from the production of the toxin, the resulting toxin concentration was so high that the death rate of S exceeded its growth rate. But if the initial frequency of the K type was below that ~2% threshold, then the outcome was reversed—the S population rose in frequency, and the K population declined, although the exclusion played out more slowly than when K started out above the threshold. What’s happening here? The K cells still had the extra cell deaths caused by the release of toxin, but the concentration of toxin was not sufficient to wipe out the S population. Some S cells were killed, and their resources—those released upon their death plus those they could no longer consume—became available to other cells. Because the competition environment was well mixed, any cell—whether K or S—had equal access to the freed-up resources. If the death rate of the K type (the proportion that produces toxin and then lyses) were greater than the kill rate of the S type, then K would decline in frequency because the resulting benefit—the extra resource that became available—was equally available to all survivors, regardless of whether they had the K or S genotype. From an ecological standpoint, it’s a nice example of a dynamically unstable equilibrium between two competitors. However, it raises a problem from an evolutionary perspective. If possession of the toxin/immunity module is beneficial when it is common in a population, but disadvantageous when it is rare, then how can it go from being rare to common? Chao and Levin recognized that a physically structured environment might be important, because it would change the distribution of the freed-up resources to the two cell types. So they repeated the competitions between K and S strains, again varying the initial frequency of the K type, except now in a semi-solid medium called “soft agar.” (The procedures get more complicated here; to propagate the competing cell types, each day they had to free the cells from the soft-agar matrix and transfer them into a new matrix.) When the two types competed in this structured environment, the unstable equilibrium disappeared, and the K strain could invade and take over from an arbitrarily low initial frequency. That is, the K genotype could now go from being rare to common. Why this difference between the liquid and semi-solid environments? In the structured environment, the bacteria grew as colonies, not as individuals floating about at random. As a consequence, the extra resources made available by the killers flowed disproportionately to their own kin. Here a picture is worth a thousand words; I show a figure from Chao and Levin below that makes this point graphically. In a sea of crowded S colonies, there’s one K colony. The K colony is larger than most of the S colonies. Each colony began from a single cell; the fact that the K colony is larger than most means that it got more than its share of resources. Even more strikingly, the K colony is surrounded by a large zone that is entirely devoid of colonies—the toxins released by the small proportion of K cells that lysed have diffused into this zone and prevented growth of S cells. The resources diffused randomly, but the K colony sat alone in the middle of this zone of inhibition that it generated, and so indeed it got more than its share of resources. The figure above is from Chao and Levin, 1981, Proc. Natl. Acad. Sci. USA; it is shown here under the doctrine of fair use. 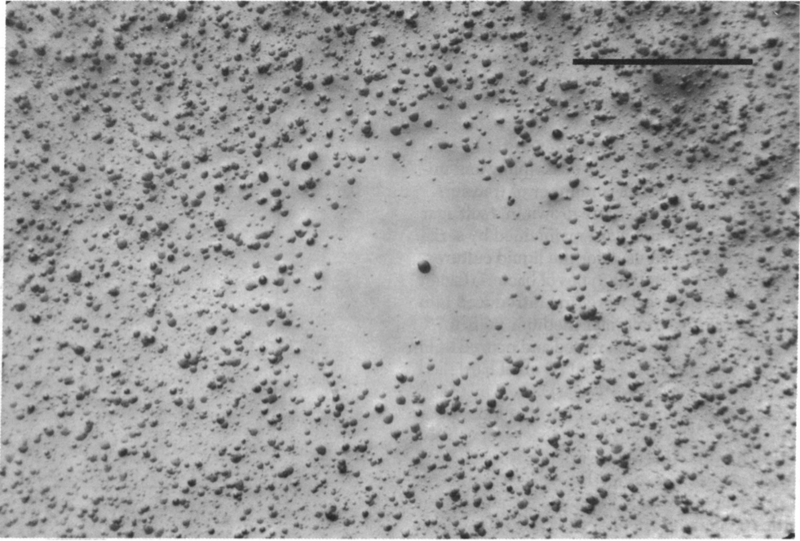 The image is centered on a single colony of toxin-producing bacteria surrounded by an inhibition zone and, further out, by colonies of sensitive bacteria. The scale bar is 0.5 mm. A Later, Related Paper: There’s another nice paper by Ben Kerr, Peg Riley, Marc Feldman and Brendan Bohannan (2002, Nature) that builds on the work by Chao and Levin. Kerr et al. added a third “player”—a third strain—into these experiments, one that was resistant to the toxin but did not produce it. In a physically structured environment, the toxin-producing killer strain could invade and displace the sensitive strain, just as Levin and Chao saw. However, the resistant strain could invade and displace the toxin-producer, because the physiological cost of resistance was less than the combined costs of toxin-production and immunity. And the sensitive strain could invade and displace the resistant strain, because the sensitive strain did not pay the cost of resistance. In other words, the pairwise interactions were non-transitive, just like the game of rock-paper-scissors. But although each pairwise interaction had a winner and a loser, the three types could coexist indefinitely in a spatially structured environment provided different spatial regions were out of phase—in effect, the three populations chased one another around in space and time. Why I like this paper so much: First, the paper by Chao and Levin beautifully illustrates how population biologists frame, dissect and analyze a complex problem—one that involves frequency-dependent effects, tradeoffs, spatial structure, and genetic relatedness along with both scramble and interference competition. Out of all these complications, there comes that “Aha!” moment when it all makes sense—just like the feeling one gets from the Luria and Delbrück experiment. Third, Bruce Levin was my postdoctoral mentor, and Lin Chao did his graduate work with Bruce. Lin had moved on to a postdoc position before I joined the lab, but this paper was one of my formative exposures to the conceptual elegance and experimental power of using microbes to study population dynamics. Lin and Bruce had also written two papers on the dynamics of interactions between bacteria and phage (Levin et al., 1977, Am. Nat. ; Chao et al., 1977, Ecology), and those papers were the ones that first led me to write Bruce about the possibility of joining his group as a postdoc. Finally, this paper provides a sobering reminder that we humans are not as special as we often imagine, even in warfare. Mindless bacteria were killing each other billions of years before we came on the scene. Perhaps we can use our minds to suppress the worst of our primal urges. [ADDED 13 Sept. 2013] Lin Chao emailed me that “The inspiration of that work was a lecture that Bruce gave in his Pop Biology class at UMass where he discussed the limitations of Lotka Volterra equations for interference competition. That sat in my mind for a couple of years until it became a real project.” So this must-read paper also provides a nice example of the productive interplay between teaching and research. Is the LTEE breaking bad? The LTEE turns 30 years old! Does Behe’s “First Rule” Really Show that Evolutionary Biology Has a Big Problem?